One of our Best Beach Weddings in Florida! Large decorated “chalkboard” sign announcing the new couple! Photographer at ceremony site with approximately 40 photos taken of the ceremony and a few poses of the bride and groom, immediately after the ceremony. Photography is available for upgrade, see additional information on the bottom of the page. For groups over 50, contact us for a quote. This non-refundable deposit is required to reserve your date. This deposit will be subtracted from the package price. Any permit fees that may be required, will be due at time of reservation deposit. All of our packages include standard photography of your beach wedding ceremony: From the start of the ceremony, during the ceremony, and we finish with a few standard poses of the bride and groom. Check out our photography options to make the most of your wedding day experience. No matter which option you choose for photography (standard, included with your package, upgrade, or Forever In Love Photos), your photos will be available by free download. You will receive a link to download your photos free to your computer or copy them to your own CD. You will not have to purchase any prints from us. A photo CD is available upon request for only $25.00 (shipping and handling fees). Add additional photography time after the ceremony with our staff photographer. This will include all of your ceremony photos, plus a group photo of all guests, immediate family photos with the bride and groom, bridal party photos, then ultimately many more poses of the bride and groom. You can add this extra photography time for only $200.00 (or the Simply Elopement package, add $100.00). If you are having over 50 guests, this additional photography time: $250.00. Once your photos are ready, you will receive a free downloadable link sent to you email. Your photos will be then be able to be saved to your any device. You will not have to purchase any prints from us, which is a great money saver after your beach wedding ceremony . A photo CD is available upon request for only $25.00 (shipping and handling fees). Please note, most of our photos shown on our photo gallery Facebook pages, etc… are from the purchased additional ceremony photography time. Are you looking for a more journalistic approach to your ceremony photography? More poses, for example “trashing the dress’ or a large outlined heart in the sand? Hire our exclusive wedding photography company: Forever in Love Photos. If you hire her for your ceremony photography, she will replace our staff photographer. She will take all of your ceremony photos, as well as all the after ceremony photos at the beach. If you hire Forever in Love Photography for your beach wedding ceremony, she will take the place of our staff photographer. And, you will receive a $100.00 credit on your package when you use her photography services (this credit cannot be combined with any other discounts, and this credit is not available for the Simply Package). Once your photos are ready, you will be able to download them for free (no purchasing prints from us!). A photo CD is available upon request for only $25.00 (shipping and handling fees).You will need to contact them directly, to check their pricing, and availability. Your independently hired photographer will take the place of our ceremony photographer. You can deduct $100.00 from our package price when hiring your own photographer (not available for the Simply Package). Once the ceremony is over, your photographer will take all the guests to the water to complete&nbsp;your after ceremony photography. This offer cannot be combined with any other discounts. 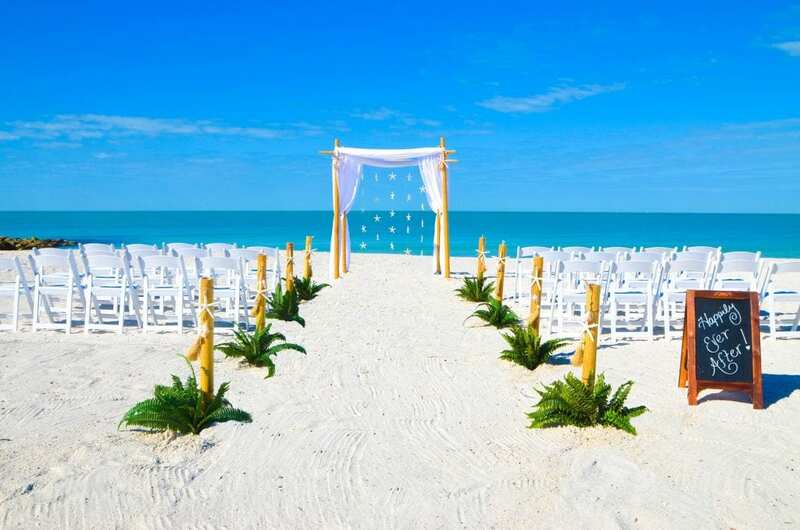 Are you looking for the best beach weddings in Florida? Look no further! Our Starfish Distinctive Design is one of our best beach weddings in Florida. Not only is everything included; set-up, breakdown, officiant, photographer, music, lemonade and water station, sand ceremony and more, but the beach decor is like no other. Our Starfish Distinctive Design package is unique to our beach wedding company. Stand out and pick this beautiful beach wedding package to show off to your friends and family. The best beach weddings in Florida include elegant beach decor to truly showcase the beauty of the ocean. With large starfish draped from the back of the bamboo canopy, starfish and bamboo aisle-way, and deluxe white chairs, you are sure to truly enhance the beauty of your Florida beach wedding. 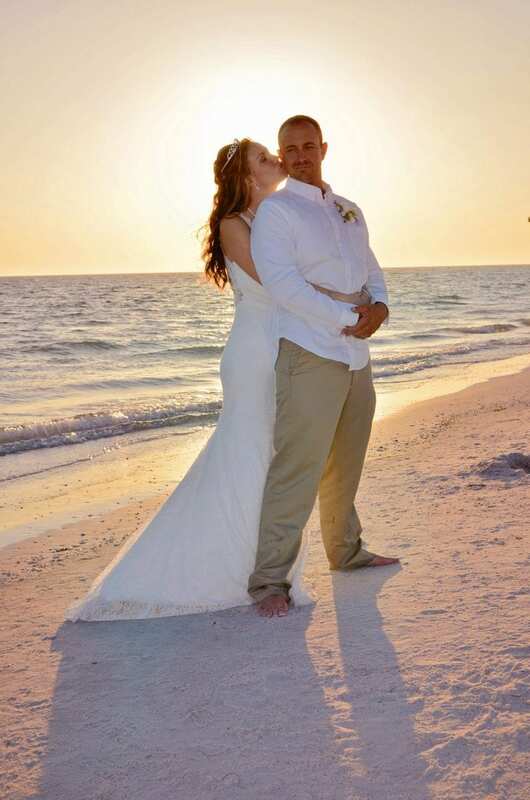 The best beach weddings in Florida have a caring and experienced beach wedding team, elegant and unique decor, help with choosing the ideal location and convenience in planning your wedding from a distance. We offer this and so much more, providing your with the best beach weddings in Florida!